OSU capped off a road trip to WVU and Pitt with a 33-9 win over previously undefeated Pittsburgh. The Cowboys dropped two bouts as Andrew Shomers was pinned at 165 and most notably Daton Fix went down to fourth-ranked Micky Phillipi at 133. I said it in my preview this one had all the makings of a trap. Daton just came off one of the most high-profile wrestling matches in recent history and came into a tough back to back with two highly-ranked wrestlers. That’s tricky, even with a kid like Fix who has wrestled in a lot of high-profile matches. In the first period Fix pressured and looked like he would control the match. He went for a few inside trips and some other shots where he was close to scoring but ultimately couldn’t secure anything. They went into the second tied 0-0. Fix started on bottom, got a quick escape and went into the third up 1-0. Phillipi got away and picked up a late takedown on the edge along with a ride out to win 3-1. Tough loss for Fix, but at a weight nationally with a really strong cast of characters any seed he comes to the NCAA tournament with will not have an easy path. I won’t dive into a ton of detail on these, but if you missed them I highly recommend you go back and check them out. All were back and forth fairly high scoring matches with a number of good exchanges and scrambles. Jacobe Smith had a bit of a rough go his first time out at 184 at the Southern Scuffle. I think he’s made some adjustments to the new weight and is now handling it pretty well. This was a good win for him. Sheets picked up a huge win over 10th-ranked Taleb Rahmani. Sheets was taken down once in the first and managed to avoid some of Rahmani’s funk to go into the second down 2-1. He got a full period ride then took bottom in the third. He got a quick escape, takedown, turn, and rideout to win 9-3. I put Sheets as the most intriguing part of yesterday’s matchup with WVU. There’s still some conversation about who will be the starter at 157, and Sheets seems to be inserting himself in it with his recent performance. Wyatt, son of Oklahoma State legend Mike Sheets, came in as a very highly-touted recruit but suffered some early injuries that nearly took him out of the sport. He’s currently a redshirt sophomore and John Smith has said OSU is requesting a medical redshirt year for him due to his previous injuries. The NCAA has been granting similar requests recently, and I would expect he’ll receive it. Even if he doesn’t win the job this year he could be a significant piece of the lineup going forward because if he’s granted the redshirt he’s essentially just a redshirt freshman this year. The Fix loss stings, but I really liked the response from Kaid Brock, Kaden Gfeller, and Wyatt Sheets. Momentum can play a role in these duals so Daton going down could’ve easily rolled into a scenario where maybe Brock, and Gfeller just get decisions. 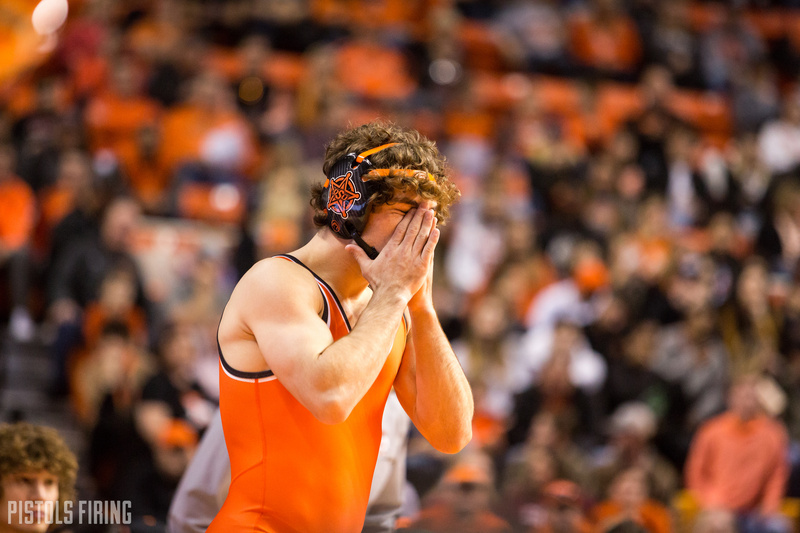 Then Sheets doesn’t pull the upset, and suddenly OSU is in a tight dual going into the upperweights where there were a lot of tough matches. The Cowboys finally come back home as they take on Iowa State next Sunday in GIA. ISU is a much better team than we’ve seen in recent years. Another big match on tap for Fix as he’ll take on Austin Gomez.